Just a short post, but marks something significant and that’s actually running a train for the first time in nearly 20 years! 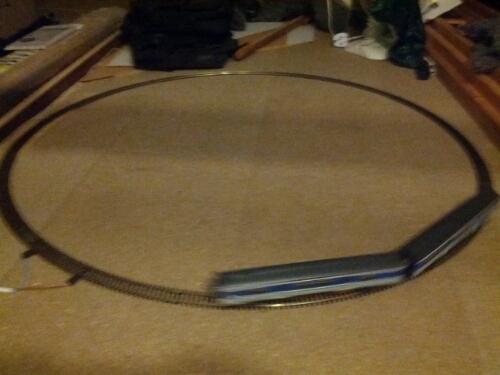 My old DC controller is now in the house, so coupled with a simple circle of track it finally allows me to test and run in some of the new models that I’ve acquired over the last year or so. The first train on the track was my Class 03 diesel shunter for old times sake, which probably could do with some general maintenance and lubrication. 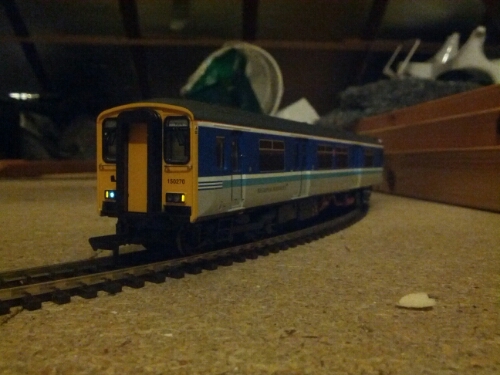 The main thing was running in my pair of Class 150/2’s in Regional Railways livery. Both of these had their required hour of running, and it was good to see them working. Since I’m happy with these in DC operation then the next challenge will be to chip them and test them on DCC. However before then I’m going to need to buy a SPROG and get my head around JMRI more! This entry was posted in Model Railway and tagged 2015, Class 150, DC, Running in, Trains by John. Bookmark the permalink.